Will Cobbs, Kelly Taffe, Daniel Morgan Shelley and Michael Sean McGuinness in “Safe House” at the Rep Studio. Photo: Jerry Naunheim, Jr. 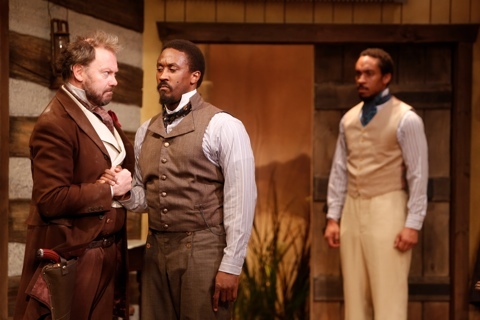 The stories of “free men (and women) of color” came to prominence a few years ago with the film “12 Years A Slave.” Now we see a searing example of one family and how they coped with being “free” in 1843 Kentucky in the Rep Studio production of “Safe House.” This Keith Josef Adkins script brings out so many emotions in the audience as two sides of the story open up and questions about what we each feel about true freedom are explored. Daniel Morgan Shelley plies his cobbler trade in the opening scene of the Rep’s Studio production of “Safe House.” Photo: Jerry Naunheim, Jr. The Pedigrews have a modest home that features a large, open, barn-like room that is the focal point. It even features a double barn door entry that, when the play opens, must be kept open at all times so the sheriff and his deputies can keep an eye on the family. Even though they are free people of color, they had been caught assisting true slaves traveling the underground railroad two years ago and are on probation for that indiscretion. Michael Sean McGuinness as Bracken woos Kelly Taffe as Dorcas in “Safe House” at the Rep Studio. 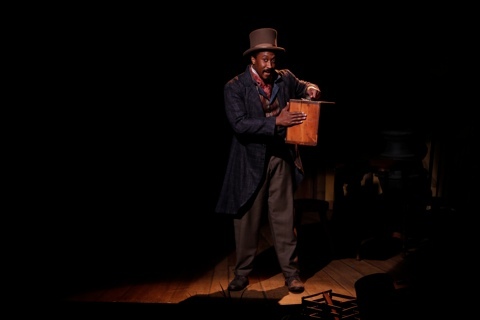 Photo: Jerry Naunheim, Jr.
Daniel Morgan Shelley is Addison, the older brother opens the play dressed impeccably including a tall, stove-pipe hat as he plies his trade as a cobbler by going door to door to make or repair shoes in the community. He is determined to prove the worth of his family in order to eventually open his own shop in their home. In fact, that transformation starts to take place during the course of the play. His younger brother Frank, however, is ready to assist slaves who know of the help the family has provided in the past with their reputation of being a “safe house.” Will Cobbs is brash and stubborn as the would-be angel to these people who want to escape the oppression of the South. 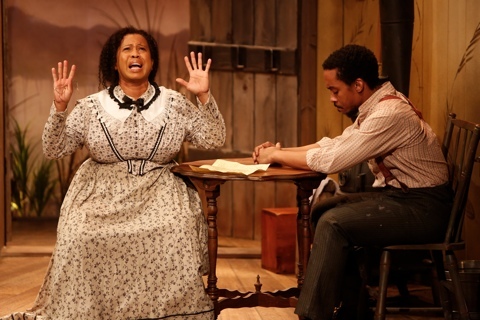 Will Cobbs and Raina Houston in the Rep Studio production of “Safe House.” Photo: Jerry Naunheim, Jr.
Kelly Taffe is superb as the facilitator in this family feud, Dorcas, who can see both sides of the story. She is also torn with doubt over a former school chum, Bracken, who is now deputized to check in on the family daily to make sure they are toeing the line. Michael Sean McGuinness plays Bracken- the white friend of the family who is torn between his obvious affection for Dorcas and his duty to (and fear of) the sheriff. Raina Houston is another local free person of color who is infatuated with Frank but must fend of the persistent advances of Addison. Finally, we have a great performance from Cassia Thompson as Roxie, a run away slave who comes to the Pedigrew household seeking asylum and help in continuing her route along the underground railroad. Michael Sean McGuinness as Bracken is confronted by Daniel Morgan Shelley as Addison as Will Cobbs, as Frank, looks on. Photo: Jerry Naunheim, Jr. These lives intertwine to create tension and suspense throughout the play. Frank and Dorcas wind up hiding Roxie in the shed unbeknownst to Addison. Things erupt when Addison discovers her and is implicated when Bracken discovers the secret as well. The script is full of wonderful moments of triumph and tragedy and, as director Melissa Maxwell points out in her program notes, brings about the question of who is truly free. Everyone must answer to someone or is dependent on the loyalty and devotion of the other to reach their goals and dreams. It’s a beautiful story that unfolds in dramatic fashion but is filled with complex questions that don’t always get answered. 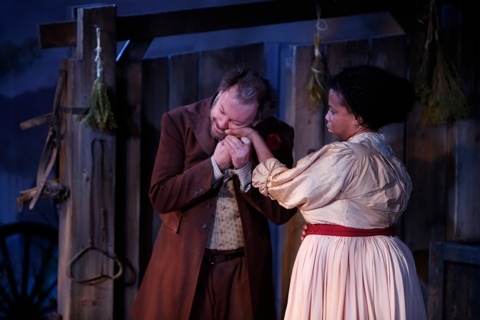 Kelly Taffe as Dorcas tries to communicate with Will Cobbs as Frank in “Safe House” at the Rep Studio. Photo: Jerry Naunheim, Jr. Besides the brilliant cast and outstanding direction in “Safe House,” we also have a wonderful technical crew that helps bring out the gritty but often ethereal feeling of the script. Peter and Margery Spack have designed a functional and beautiful set that is bathed in soft, ghostly lights by Mark Wilson. Myrna Colley-Lee’s costumes are period perfect and the unusual and effective original music and sound design by Scott O’Brien adds to the dichotomy of the hard-edged yet other-worldly story. “Safe House” is a play that haunts days after seeing it. Thanks to a first rate cast and a solid and well-crafted script, this one is not to be missed. 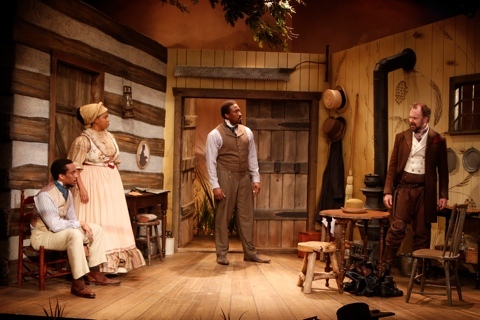 It plays at the Studio Theatre of the Repertory Theatre of St. Louis through February 8th. Call the box office at 314-968-4925 or contact the Rep at http://www.repstl.org for tickets or more information. This entry was posted on January 29, 2015 at 9:43 am01 and is filed under Uncategorized. You can follow any responses to this entry through the RSS 2.0 feed. You can leave a response, or trackback from your own site.